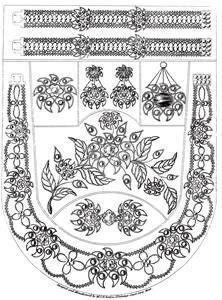 Single sheet design for beaded jewelry suite (parure) including two bracelets, two brooches, a necklace, earrings, a pendant, and a large ornament (bodice ornament? tiara or hair ornament?). Designs use beads of mixed sizes, some on stiff wire forms. Sheet bears the notation "Designed and Manufactur'd by Mr. I.H. Barlow No. 1. Grange Court Carey Street. Donated by Arnout Bosch, scanned and edited by Sytske Wijnsma. Transferred to Rijksmuseum Research Library, 2018.